Image caption The man had thanked people who were supportive of "certain names that populate in different cultures"
An Australian who made global headlines after saying he was fighting to use his real name on Facebook, admits it was hoax. The man had claimed Facebook would not allow his real name as it could be considered offensive. But he later said on Facebook his real name was "Joe Carr" (or perhaps joker). He said what had started as a joke between friends "became a prank that made a fool out of the media". But he said it also brought out the best in people and gave encouragement to people with "truly interesting and idiosyncratic names". The hoaxer is of Vietnamese origin. 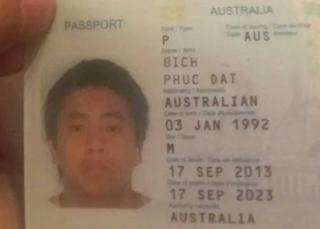 His name was given as Phuc Dat Bich - when properly pronounced in Vietnamese, which is a tonal language, it sounds like "Phoo Da Bi". Facebook have not responded to BBC requests for comment. I have to admit I fell for the prank by Mr Bich Phuc Joe, or whoever he is. In the newsroom, dealing day-in-day-out with news that's often about disasters, both natural and man-made, the story of an unfortunately named person who thanked the community for their support seemed appealing. Being Vietnamese, I knew that Bich was not a common surname (but not impossible) in Vietnam, but many immigrants change their names or get them in the wrong order when registering in their new countries. Vietnamese names are highly confusing to say the least. After the story came out on the BBC News website, I received many emails from readers saying it had made them laugh - I hope they are still laughing now, even though we've all been hoaxed. The Facebook user, whose profile still shows him as Phuc Dat Bich, had said back in January that he found it "highly irritating the fact that nobody seems to believe me when I say that my full legal name is how you see it". He posted a picture of his passport showing his name, and said he had had his Facebook account "shut down multiple times". Posts under that name date back to at least 2014. The story was picked up last week - first by social media then by the world's media, including by the BBC. Earlier this week, he even went as far as thanking his supporters, saying he hoped he had "played a part in brightening your days". But in a surprise on Wednesday he said: "Do you remember the story; The boy who cried wolf? "Imagine that boy grew up into a mischievous man with 21st Century technology at his finger tips. "What started as a joke between friends, became a prank that made a fool out of the media. But he also said Facebook "needs to understand that it is utterly impossible to legitimise a place where there will always be pranksters and tricksters". Mr Bich/Carr said his "ordeal" had taught him "not to trust the credibility of the media" and that it "goes to show that an average joe like myself can con the biggest news sources with ease". But he also praised the response to his prank saying it "didn't bring out the anger and darkness that we often see on the internet, but it brought a levity and humanity in a time we need it most." It is not clear if he photoshopped his passport. Physically altering a valid passport would be illegal. Update 27 November 2015: This story has been amended to remove references to the man's name from the headline.